The MotionCage is a series of functional training system exercise stations that can be configured in several ways to best suit your layout and needs. 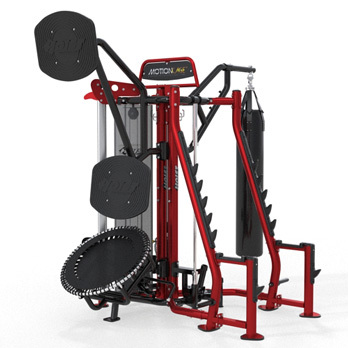 Configurations can include a Squat Rack, a Renegade Station, Dual Hi-Lo Pulleys, a Boxing Station, a Rebounder Station, a Wall Target Station, and more — all with integrated accessory hooks for bands and resistance straps storage, and shelving for kettle bells and medicine balls. A sleek design and colorful finish invites those wanting to be their best to jump on and “Start a ComMOTION”.